While many job interviews involve variations of the same questions, IT interviews often include specific technical questions to help assess your skills and capabilities. Hiring managers typically need more details to make sure you possess the experience they need to complete their teams, ensuring you can properly handle the duties of the position. Even though it can seem like preparing for these questions is difficult, there are ways to anticipate what may lie ahead. To help you get ready for your next IT interview, here are some tips for managing the process. The job posting is your biggest source of information as it outlines the key skills and abilities the ideal candidate must possess. Specific programming languages, systems, software or other knowledge areas listed in the announcement will likely be covered by the hiring manager’s questions, so be prepared to speak about each of them. To show you are a strong candidate, relate each skill to a specific example from your prior duties or educational experiences. That way, you can provide details beyond just confirming you are not only familiar with the skill, but you know how to use it in a practical way. When most job seekers think of interviews, they imagine sitting across from the hiring manager and answering questions. However, many IT recruitments include a technical interview as well as a traditional variant, and they aren’t managed the same way. A traditional interview typically matches the image candidates have in their head. Technical interviews can be somewhat different, as they involve more demonstrations and less talk. For example, you may be asked to write some code on a whiteboard during a technical interview to show how you would solve a particular problem. If you are coming in for a technical interview, it is important to review any fundamental skills related to the position that may be demonstrable. Be prepared to write out responses by hand and give explanations regarding why you took a particular approach. While you might not know the exact question until it is asked, understanding the format is somewhat different during a technical interview can make it less of a shock when you are asked to write out a response. Few fields change as quickly as IT, and many hiring managers want employees who stay up to date on new developments on their own. This not only shows you have an interest in the work outside of a formal job setting, but you understand how a role can change over time as new technologies emerge. Before going into your interview, look up recent announcements and new products that relate to the job specifically. That way, when the interviewer asks if you have an interest in anything upcoming, you have specific examples to provide. Are you looking for your next IT job interview? 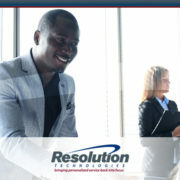 If you are looking for more tips regarding IT interviews or are seeking new opportunities in your field, Resolution Technologies can help. Contact us to discuss your employment needs today.